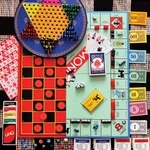 Gifts and Games for People with Dementia or Alzheimers. As people age, it can greatly affect their brain function and can limit their skills. Seniorstore offers games for people with dementia or Alzheimers, which can stimulate brain function and exercise many parts of the brain. Our 36 piece giant piece puzzles keep an Alzheimers patient entertained without being too difficult. They are designed for those that have mild to moderate Alzheimers. We also offer 12 piece puzzles which are ideal gifts for those friends or family members with moderate levels of the disease.